China CITIC Bank International (CNCBI) is part of the cross-border commercial banking franchise of CITIC Group in Beijing. Together with our parent bank China CITIC Bank, we shall build the CITIC commercial banking franchise to be a world leading brand. Harnessing the strengths of our parent bank China CITIC Bank (CNCB), we are CNCB's overseas platform for pursuing business expansion in Hong Kong, Asia and internationally. We are a Hong Kong-based full-service commercial bank that offers a broad spectrum of financial services spanning wealth management, personal banking, wholesale banking as well as global markets and treasury solutions. We aspire to be “the best overseas integrated financial services institution”, with the best international standards and capabilities. By providing value-creating financial solutions, we define and exceed both the wealth management and international business objectives of our Greater China and overseas customers. Our footprint includes 30 branches in Hong Kong, as well as overseas branches in New York, Los Angeles, Macau and Singapore. The Bank also provides banking services in Beijing, Shanghai and Shenzhen through a wholly-owned subsidiary. We are part of CITIC Group Corporation, a state authorised investment institution and a leading state-owned multinational financial and industrial conglomerate. The financial services platform of CITIC Group Corporation is amongst the most comprehensive in China, covering cross-border commercial and investment banking, securities, insurance, trust services, asset management, direct investments, commodities and futures, etc. We offer our clients depth of knowledge and market connectivity in the Mainland through our relationship and support from China CITIC Bank and our ultimate parent company, CITIC Group Corporation. Our business model is structured to offer effective and timely “one-stop-shop” financial solutions to customers with cross-border banking and financial needs between China and the rest of the world. Working closely with our parent bank China CITIC Bank, we are also well positioned to capture cross-border opportunities, arising from Hong Kong's rising role as an offshore RMB centre. We have a client-oriented culture focused on delivering value-creating solutions with transparency, integrity, professionalism, discipline, vigour, innovation and progressiveness. Managed by a team of highly qualified professionals with diverse international banking experience, we are committed to delivering financial solutions that go beyond customer's expectations. We value and nurture talents who share our core values: Customer-Centric, Progressive, Execution, Value Creating, Building People Building Team and Integrity. We are committed to a high level of integrity, business excellence, world-class execution and corporate governance. China CITIC Bank Corporation Limited (“CNCB”), via its wholly-owned subsidiary CITIC International Financial Holdings Limited, is CNCBI’s controlling shareholder with a 75% stake. Last updated on 10 January 2018. The CITIC Group Corporation of Beijing is our ultimate parent company. 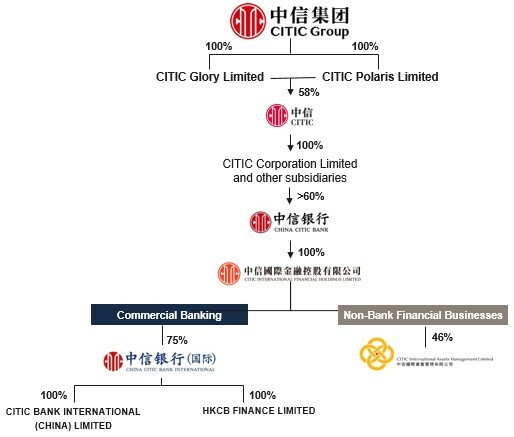 CITIC Group Corporation is a state authorised investment institution and a leading state-owned multinational financial and industrial conglomerates. Its financial services platform is amongst the most comprehensive in China, covering cross-border commercial and investment banking, securities, insurance, trust services, asset management, direct investments, commodities and futures, etc. Please follow this link for more information on CITIC Group. CNCB, our parent bank in China, is listed on both the Hong Kong and Shanghai stock exchanges. It is the seventh largest bank by assets in China, and has a network of 773 branches in Mainland China that are strategically located in the economically fast growing eastern and coastal regions as well as in the key inner areas of the country. Its breadth of services cover corporate banking, international trade, retail and private banking, credit cards, as well as treasury and capital markets. To be the China Financial Solutions Provider highly regarded by institutional and personal customers who aspire to realise the growth potential in Asia. We focus on value creation for our stakeholders. Core to our offering is our intimate knowledge of and our network capability in China, coupled with customer-centric execution of world-class quality. Nurturing of talent, team spirit and sharing of ownership and success are our key competitive advantages.